7 Best of the Best of 2016 Lists - Chapter Books! I dedicate this story to all the accepting aunts out there who love their families unconditionally and support them fully. Growing up on Long Island, my Aunt Pat lived kind of far away in the Adirondack Mountains, which was about a six-hour drive, so I didn’t get to see her very often. However, we always had a great relationship and kept in touch via letters. She has a great sense of humor and we made each other laugh often. She was also very thoughtful. She knew I hated onions so when she made her special macaroni and pea salad, she made a small separate portion for me, without the onions. I still don’t know why people like onions (they make your breath smell, make you cry, and give you gas). Although my aunt and I always got along great, and she is a warm and caring person, I did not feel comfortable telling her about a secret I kept for many years: I was gay. After all, she was from a very small, conservative mountain town and I didn’t see her that often. 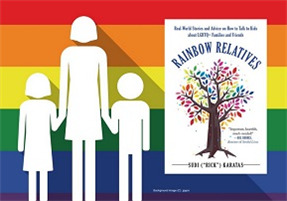 I just enjoyed spending time with her when I saw her, so I didn’t feel the need to bring it up—until I began writing a book titled Rainbow Relatives: Real-World Stories and Advice On How To Talk To Kids About LGBTQ Families and Friends. I didn’t want her to find out from the book, so I decided to tell her (when she was almost eighty-years-old). A couple of other family members advised against it, but I went ahead and wrote a letter to her, just like I used to when I was younger. About three days later, the same day Aunt Pat probably got the letter, she called when I wasn't home and I found a message from her on my answering machine. It was so beautiful, it made me cry and smile at the same time. She said it didn’t matter, she loved me anyway, no worries—she had loved me since the day she first saw me as a baby. She went on and on, and it was just the sweetest message. I kept the recording for a long time—till someone accidentally erased it. (Said person is now on my “you know what” list.) My relationship with my aunt is now even stronger because neither of us are keeping any secrets, and I don’t have to hide anything or watch what I say. I hope my book, Rainbow Relatives, will help nieces and nephews come out to aunts (and uncles and other family members) and will help any aunts who are lesbians come out to their families, as well. In the book are some stories from aunts who came out to their nieces and nephews. I even interviewed country singer Chely Wright for my “Celebrity Thoughts” chapter. Chely came out to her nieces and nephews shortly before she came out to everyone in her book Like Me and her documentary called:" Wish Me Away." One woman I spoke to told me about the experience she had with her family in the early 1990s. Liza was in her twenties when she came out, and her niece was three years old at the time. The little girl had approached an adult visiting their home one day and announced, “My Auntie Liza has a wife.” The adult replied, “Well, my brother John has a husband.” To that, the little girl simply responded, “Oh, okay.” I’ve seen Liza’s experience reflected in the majority of surveys and interviews I conducted with people who have come out at different times throughout the decades: someone being gay is no big deal to a child, especially a younger child with minimal social biases to affect their opinions. When someone comes out later or the child is told when they’re older, it seems that more “loss” is incurred, including loss of expectations. I think it really is this simple, although we as humans seem to complicate everything. Jo is gender nonconforming. Gender nonconformity is behaving and appearing in ways that are considered atypical for one’s gender. When she spoke to me, she had a five-year-old nephew whom she has been very close to since he was a baby and who still likes to spend a lot of time with his Aunt Jo. One day, the boy looked closely at his Aunt Jo and had a sudden realization. Jo told me that when her nephew’s parents were telling him about gay marriage and how his Aunt Jo would be getting married to a woman, all the nephew cared about was, “When do I give the rings?” He was extremely excited about the whole wedding and the part he was playing in it and couldn’t care less who his aunt was marrying. The film also shows Chely’s seven-year-old niece, Amelia, reading about Chely in People magazine, and shares with the viewer the conversation she had with her mom about it. Sudi (“Rick”) Karatas has written many screenplays, songs, and sketches. He cowrote the feature film Walk a Mile in My Pradas and the screenplay Charlie’s Dream, an inspirational family film. Rainbow Relatives is his first book. Karatas grew up in Syosset, New York, and now resides in Van Nuys, California.